Materials scientists from the National University of Science and Technology "MISIS" (NUST MISIS) developed a unique sandwich steel-vanadium-steel material that is able to withstand temperatures of up to 700°C, hard radiation exposure, mechanical stress and chemical exposure for a long period of time. The material can be used in the shells of nuclear reactor cores. The rods belong to the key functional units of the nuclear reactor. They come into contact with uranium fuel and control the intensity of the nuclear reaction. The main problem of the new generation fast neutron nuclear reactor, which allows reusing uranium, is the serious loads to which these rods are subjected. The maximum operating temperatures of the fuel element shells in the new generation reactors reach 550-700°C. Sodium, the liquid metal coolant, operates outside. The loads created are much higher than those that the core shells of existing reactors can withstand. 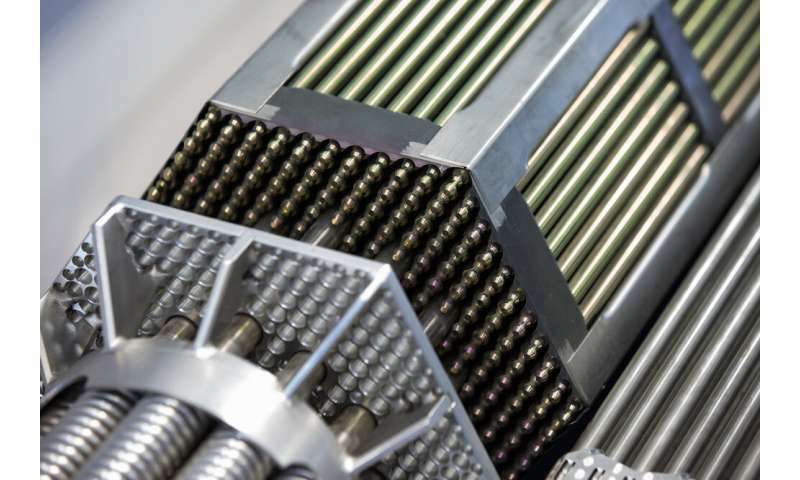 To close the nuclear fuel cycle in a new generation fast neutron reactor, new structural materials that can provide a higher fuel burn-out compared to what is currently achieved, are needed. These materials should withstand damaging radiation doses of up to 180-200 dpa (displacements per atom), instead of the maximum 100-130 dpa, that are typical for existing materials. In such conditions, shell rods made of steel are simply not able to work. The aim of materials scientists to create material that would be capable to withstand the simultaneous impact of several factors in a super-aggressive external environment over a long period of time. "Our team has developed a three-layer material, "steel/vanadium alloy steel". The ferritic corrosion-resistant steel in it provides corrosion resistance, and the vanadium alloy (V-4Ti-4Cr) provides heat resistance and radiation resistance sufficient to withstand the effects of ultra-rigid environments of a nuclear reactor", Aleksandra Baranova, research co-author, post-graduate student of NUST MISIS Department of Metallurgical Science and Physics of Strength, says. According to her, to create such a composite is not an easy task, since the two materials should be as monolithic as possible in the joints. "The problem was solved by the use of complex deformation and heat treatment of three-layer billets, including hot co-extrusion (pressing), radial forging and joint rolling. As a result, a "transition zone" is formed at the boundary of the components. The materials diffuse into one another, which provides high strength of their connection," Alexandra says. As a result, steel and vanadium alloy "grow" into one other, scientists report. The research team managed to create a prototype of the core shell, which is a monolithic three-layer tube. Laboratory tests show high mechanical strength of the composite at operating temperatures of up to 700°C. In the near future, scientists plan to begin long-term studies of the sandwich material for radiation resistance.